Faba bean (Vicia faba L.) is currently the third most important cool-season food legume in the world. Faba bean provides an important source of dietary protein in human diet, edible oil and animal feeds. Like other grain legumes, faba bean contributes to sustainable agriculture in the management of soil fertility and plays an essential role in crop rotation. Faba bean is a diploid with 2n = 2x = 12 chromosomes [1, 2], is partially cross-pollinated ranging from 4 to 84% , and possesses one of the largest genomes among crop legumes (~13000 Mb). The development of saturated linkage maps as well as the identification and map-based isolation of important qualitative traits or quantitative trait loci is therefore complex and expensive. A saturated genetic linkage map provides an invaluable tool in plant genetic studies and practical breeding. One of the first genetic linkage maps of faba bean was constructed by Van de Ven et al. with only 17 markers; followed by successively more detailed genetic maps by Torres et al. with 51 markers, Satovic et al. with 157 markers, Vaz Patto et al. with 116 markers, Roman et al. with 121 markers, Roman et al. with 192 markers and Avila et al. with 103 markers. To date, faba bean genetic maps have been restricted to morphological, isozyme, RFLP, RAPD, a few seed protein genes and four SSR markers. These markers have been limited either in number, transferability or in their ability to provide syntenic information with other legume species. The recent generation of abundant genomic and genetic resources focussed around the model species Medicago truncatula and Lotus Japonicus has opened up abundant opportunities for creating gene-based molecular markers that are ideal for genetic mapping in general and comparative mapping in particular [11–16]. In this approach, oligonucleotide primers were designed from sequences of conserved regions in gene exons that flank polymorphic regions such as introns or microsatellites. This PCR-based, codominant marker system has remarkably increased the efficiency of transferring genetic information across species. Examples include the comparison of M. truncatula with alfalfa, pea, chickpea, soybean, mung bean, lentil and lupins [12–18]. Comparative genomic studies can expose and confirm phylogenetic relationships among species and determine patterns of chromosomal evolution and syntenic relationships. More importantly, comprehensive comparative genomics can facilitate back-and-forth use of genomic resources between different legumes species, and help to reduce cost and increase efficiency in genetic research as well as crop breeding. The use of conserved genome structure to assist in transferring knowledge among related plant species is well established in grasses [19, 20] where synteny greatly assists in gene identification among related species. In this paper we report: (1) the application of gene-based markers in faba bean; (2) the development of the first exclusively gene-based genetic and comparative map for the species; (3) analysis of syntenic relationship between faba bean and M. truncatula; and (4) the levels of homology existing between faba bean, M. truncatula and lentil, a closely related species to faba bean. A gene-based genetic map of faba bean genome was constructed using a population of 94 F6 RILs generated from a cross between faba bean line Vf6 (equina type) as the pollen recipient and line Vf27 as pollen donor (paucijuga type). These accessions have been widely used in previous genetic studies [7, 9, 21] and the population was developed at IFAPA, Centro Alameda del Obispo, in Córdoba, Spain, using diploid parental individuals. Total genomic DNA was isolated from each parent and F6 individual as previously described . A total of 796 intron-targeted amplified polymorphic markers (ITAPs) were used for this study. These were composed of four sets of ITAPs; 340 ML and Lup primers developed from alignment of M. truncatula and Lupinus spp. database EST sequences; 160 MLG primers based on alignments between M. truncatula, Lupinus albus, and Glycine max (, with a subset of these denoted AtMtL-); 143 cross-species makers (MP) developed by the Department of Plant Pathology, University of California, Davis, USA ; and 140 GLIP markers created by the European Grain Legumes Integrated Project (GLIP) based on primarily on M. truncatula and pea (Andrea Seres, pers. comm.). The majority of the ITAPs markers could be positioned to a physical location in the M. truncatula psuedogenome since most primers were designed from genes in characterized chromosomal regions. Each primer pair was screened on V. faba parental DNA. PCR conditions were optimised to produce clear single amplicons, and single PCR products of the same size were purified and directly sequenced. Different detection methods were used to genotype the F6 population dependent on the type of polymorphism . Details of each marker are given in Additional file 1. 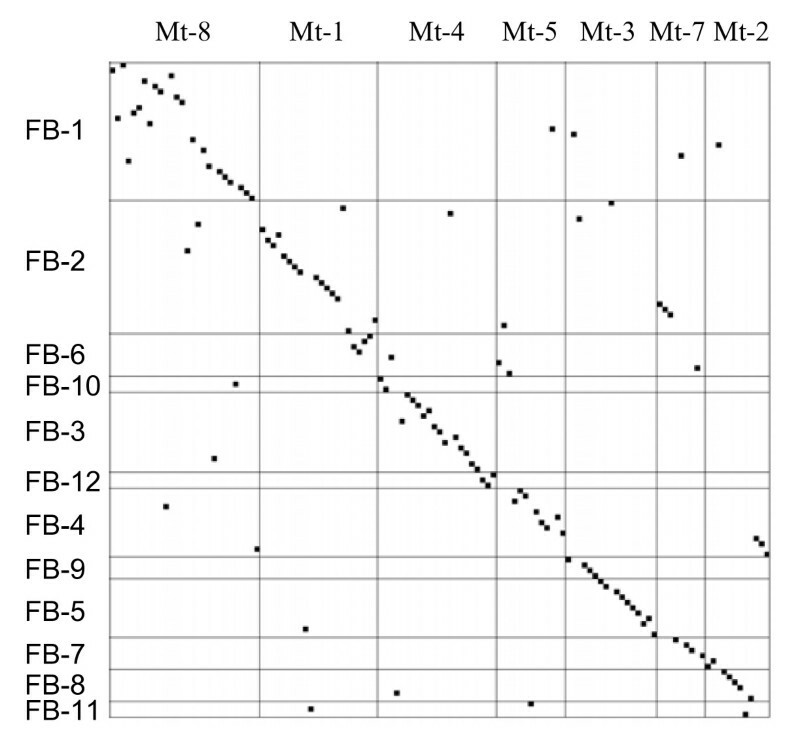 Chi-squared analysis (P < 0.05) was applied to test the segregation of the mapped markers against the expected Mendelian segregation ratio for co-dominant inheritance in the faba bean F6 RIL population. Genetic linkage mapping was conducted with MultiPoint v 1.2 software , with a recombination fraction (rf) of 0.29 (LOD = 9.0) using 5000 bootstraps. Map distances were calculated in cM by applying the "Kosambi" function. Groups of linked markers that were similarly distorted were accepted for linkage mapping. Independent markers showing significant segregation distortion and markers with missing data (> 10%) were rejected for linkage to avoid bias and false linkages. Genetic maps were drawn with the software program MapChart v 2.1 . Markers mapped in faba bean were located on the M. truncatula map by aligning the ESTs originally used to design the ITAPs primers with M. truncatula BACs in the Medicago pseudogenome Mt2.0 build 8/10/2007. Alignments with a BLAST E values < 1e-20, hsp identity ≥ 60%, and hsp length > 50 nt were retained. Precise positions of markers were obtained by aligning the ITAP primer sequences with M. truncatula BACs using BLASTN with an expected value < 1e-4 (primer length varied from 18bp to 28bp). Approximate positions of markers that had been genetically mapped in M. truncatula but not yet positioned on the physical map were obtained from the M. truncatula genetic map . Grid Map  was used to compare the genetic maps of faba bean and M. truncatula. Ordered loci from faba bean and M. truncatula linkage groups were listed vertically and horizontally, respectively, and dots were positioned on the diagram at the intersection of the locations of the corresponding markers in the two genetic maps. Of the 796 markers screened for amplification in genomic faba bean DNA, 19% produced two or more amplicons of different sizes. Five hundred and seven were selected and optimised for single-locus amplification. Fifty percent (254) of these produced clear single band amplicons (Table 1). Seven markers that produced two amplicons (AIGP, GLIP172, GLIP429, GLIP621, GLIP651, Lup226 and MMK1) and one that produced three amplicons (LG34) were also mapped as they exhibited convenient length polymorphisms. One hundred and sixty-five polymorphic markers were identified (Table 1), of which 151 markers were used to genotype the 94 individuals of the F6 RIL population (supplementary Table 1). Apart from the GLIP markers which were selected for their ability to amplify faba bean genomic DNA before this study, 'MLG' and 'MP' markers worked equally well in faba bean (83% and 84%, respectively) but 'MP' markers produced fewer polymorphic amplicons. Amplification rate of the 'ML' markers was the poorest (34%), less than half the rate of the 'MLG' and 'MP' groups (Table 1). Likewise, the polymorphism level of the 'ML' markers was the lowest. Both 'MLG' and 'GLIP' markers produced very high levels of polymorphism in the mapping parents (70%; Table 1). DNA sequences of markers have been submitted to Genbank under accession codes FH893713 – FH937528. aFigures in parentheses are percentages of amplified markers of the total markers screened. bFigures in parentheses are percentages of sequenced markers of the total amplified markers. cFigures in parentheses are percentages of polymorphic markers of the total sequenced markers. Nineteen mapped markers (> 12%) deviated significantly (P < 0.05) from the expected Mendelian inheritance ratio of 1:1. About half of these markers (9) were highly distorted (P < 0.01). Fifty percent of the distorted markers segregated in favour of the Vf6 parent and fifty percent in favour of Vf27. Nine of the 12 faba bean LGs contained one to four of these distorted markers, which tended to be scattered throughout the faba bean genome. However, it is noteworthy that distorted markers grouped together in chromosomes FB-1, 7 and 8 (Figure 1). A gene-based genetic linkage map of faba bean ( Vicia faba L). Marker distance is given in cM. *indicates markers with distorted segregation. A total of 151 genic markers were used to generate the first gene-based and comparative map of faba bean. This map was constructed with a recombination fraction of 0.29 [LOD = 9.0, 27]. The map consists of seven main linkage groups (FB-1 to FB-7) and 5 fragments (FB-8 to FB-12), which varied in length from 23.6 to 324.8 cM, and spans a total of nearly 1686 cM (Figure 1 and Table 2). The number of markers per LG ranged from three to 30 markers. In addition, there was one pair and thirteen unlinked markers. Eight markers co-segregated at four loci, (three loci in FB-1, one in FB-3; Figure 1 and Table 2). The maximum distances between markers ranged from 13.8 cM in FB-12 to 40.2 cM in FB-3 with an overall mean gap distance of 14.6 cM (Table 2). aCalculated by dividing the length of the chromosome (cM) by the number of space/distance between markers/loci. Of the 135 genic markers that mapped to the 12 faba bean LGs in Figure 1, 127 were assigned to the M. truncatula genetic or physical maps . One hundred and four of these (82%) were in syntenic regions. Clear evidence of a simple and direct macrosyntenic relationship between the V. faba and M. truncatula is presented in the dot matrix in Figure 2. The formation of clear isoclinic diagonal lines along the linkage groups provides a strong indication of the conservation of gene order in the two legume genomes. The extensive colinearity was particularly prevailing between FB LG 1, 2, 3, 4 and Mt LG 8, 1, 4, 5 where syntenic regions accounted for 90%, 86%, 50% and 47% of the M. truncatula pseudogenome, respectively (Table 3). Matrix plot of common gene-based markers mapped in faba bean and M. truncatula. The faba bean and M. truncatula loci are listed vertically and horizontally, respectively, according to their linkage group order. 1Data was either based on information from M. truncatula genome sequencing website  or from Choi et al. .
2Data is provided for three or more colinear markers and excludes markers on the same chromosome rearranged relative to the order in M. truncatula. However, chromosomal rearrangements were also evident at a moderate level. For example, M. truncatula chromosomes 1 and 7 together with 5 and 2 merged to form the faba bean LGs 2 and 4, respectively. Similarly, M. truncatula chromosome 2 splits into FB- 4 and 8 and M. truncatula chromosome 3 into FB-5 and 9 (Table 3 and Figure 2). Inversions and translocations were also notable among the orthologous markers within each syntenic pair of faba bean and M. truncatula LGs (Figure 2). A high level of co-linearity was found between the faba bean, lentil and M. truncatula genomes based on the macro-synteny established between faba bean and M. truncatula (this study) or lentil and M. truncatula  using only common orthologous markers which mapped in all three species (Figures 3 and 4). The pattern of homology between faba bean and M. truncatula was similar to that between lentil and M. truncatula: for example, two linkage groups FB-1 and Len-II were exclusively syntenic to M. truncatula LG_8 and shared seven markers in common. Common markers were evenly distributed in all the three corresponding LGs suggesting that FB-1 and Len-II are essentially co-linear (Figure 3A). 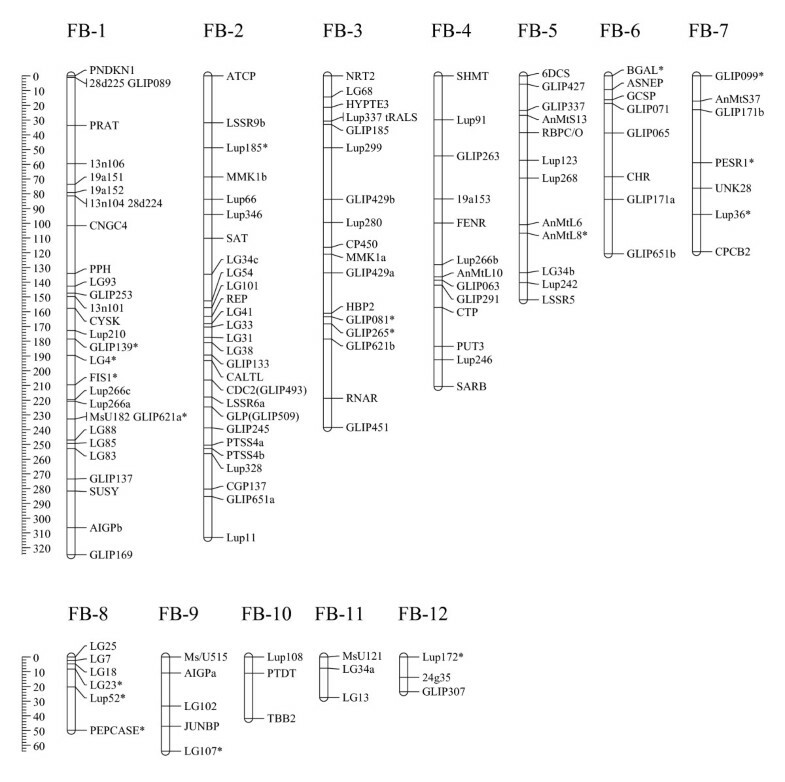 Likewise, FB-2 and Len-III were both syntenic to Mt-1 and orthologous to each other with nine markers in common (Figure 3B). Other examples are FB-3, Len-I and Mt-4; and FB-4, Len-V and Mt-5 (Figure 2, 4A and Phan et al., 2007 ). 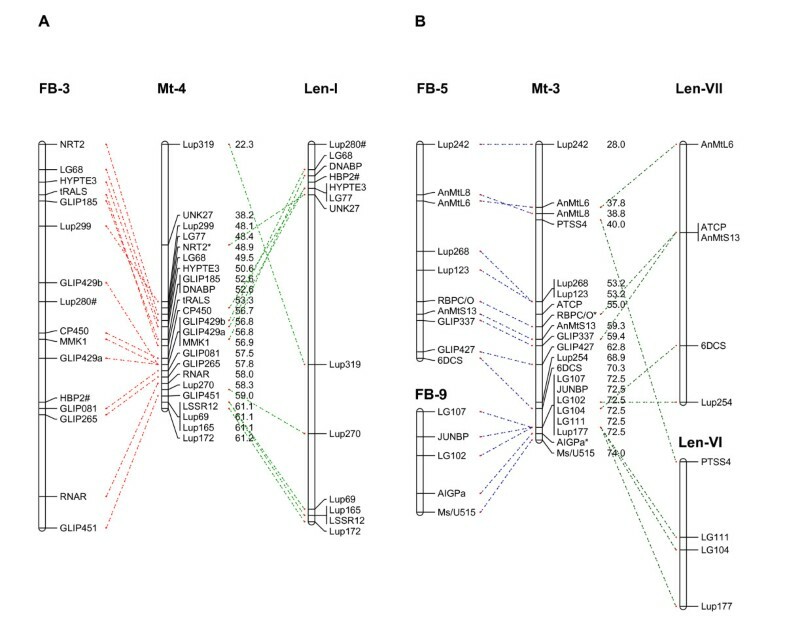 FB-5 and FB-9 were co-linear with lentil Len-VII and LenVI, respectively, and both pairs of these linkage groups were colinear with Mt-3 (Figure 4B). This suggests shared ancestral chromosomal changes in faba bean and lentil compared to M. truncatula and confirms their phylogenetically closer relationship. Evidence of shared macrosynteny between V. faba chromosomes FB-1 and FB-2, L. culinaris and M. truncatula. Common orthologous markers are depicted by dashed lines and marker distances are provided in centi-Morgans for M. truncatula only. The figures exclude markers that could not be positioned in the M. truncatula psuedogenome. A ~ indicates markers that map distally in the corresponding M. truncatula chromosome relative to faba bean, and markers suffixed a, b or c denotes derivation from primer pairs that produced multiple PCR products. 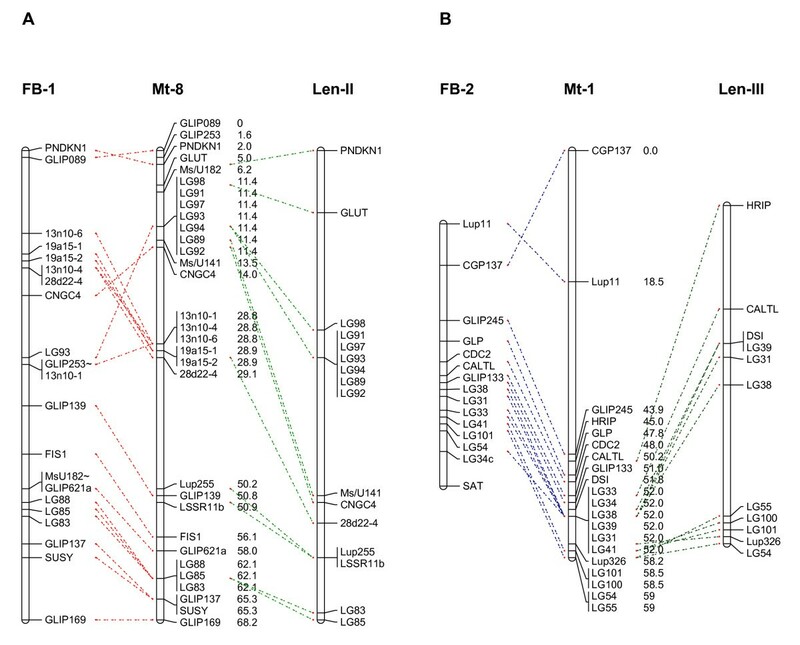 Evidence of shared macrosynteny between V. faba chromosomes FB-3 and FB-5, L. culinaris and M. truncatula. Common orthologous markers are depicted by dashed lines and marker distances are provided in centi-Morgans for M. truncatula only. The figures exclude markers that could not be positioned in the M. truncatula psuedogenome. Markers highlighted * were previously mapped  but not positioned in the M. truncatula psuedogenome. # indicates markers orthologous between lentil and faba bean but unmapped in M. truncatula and markers suffixed a, b or c denotes derivation from primer pairs that produced multiple PCR products. Several ITAP markers used in this study were designed from different genes on the same M. truncatula BACs. These markers often mapped in clusters in two or more species and in common syntenic regions of corresponding linkage groups. An example is shown in Figure 3A with markers LG89-LG98 designed from M. truncatula BAC AC140032 and LG83-LG88 from M. truncatula BAC AC138131 in M. truncatula chromosome 8. Similarly, with the exception of LG34c, markers LG31-LG43 designed from M. truncatula BAC AC152751 in Mt chromosome 1 were located in one area of FB-2 and Len-III as shown in Figure 3B; markers AnMtL6-AnMtL8 and LG102-LG112 from M. truncatula BAC AC147712 and AC135800 in Mt chromosome 3 were grouped together on corresponding pairs of LGs i.e. FB-5 and Len-VII and FB-9 and Len-VI; respectively (Figure 4B). The first genetic map of faba bean composed exclusively with gene-based co-dominant molecular markers was constructed using a F6 RIL population between lines Vf6 and Vf27. The map is also the first to enable the establishment of syntenic relationships between faba bean and the model legume M. truncatula, comparison with other legume species, and integration with genetic maps available in faba bean. The map is composed of 12 linkage groups and 151 genetic markers. Although the number of chromosomes in faba bean has been reported as 2n = 12 , the number of linkage groups in recent genetic maps in the species range from 13 to 18 [7–10] and previously as many as 48 have been reported . The high number of linkage groups compared to the number of chromosomes may be due to the fact that faba bean possesses one of the largest genomes among cultivated legumes (~13000 Mb). This compares with other well-characterised species such as M. truncatula, chickpea, soybean, lentil and pea which have genomes of ~450 Mb, ~740 Mb, ~1200 Mb, ~4000 Mb and ~4000 Mb respectively . Of the 24 non-orthologous markers found in this study, eight were from primer pairs where more than one PCR gel band was present and where two or more such amplicons were mapped. In each case, at least one amplicon mapped syntenically. The percentages of markers sequenced in faba bean were lower compared to lentil (63%, 26% and 55% compared to 93%, 69% and 65% for MP, ML and MLG markers respectively, Table 1). This was due to higher proportion of markers amplifying multiple bands in faba bean compared to lentil (data not shown), which may imply duplication. Differences in amplification, sequencing and polymorphism rates among different types of markers used for this study reflect the mode of design of the markers. Since 'MP' and 'MLG' markers were often based on the homology of more than two phylogenetically distant species, they are more likely to work in different legume lineages. The same observation was reported for these primer sets in lentil . Despite the large differences in genome sizes between M. truncatula and V. faba, a simple and direct relationship between the two genomes was identified in this study. Given the number of markers used (151), the syntenic regions cover a large proportion of M. truncatula pseudogenome with 90%, 87%, 66%, 62% and 47% for M. truncatula chromosomes 8, 1, 3, 4 and 5, respectively (Table 3). The appearance of clear isoclinic diagonal lines along the linkage groups in Figure 2 also demonstrates strong evidence for the extensive co-linearity between linkage group pairs of the two species. Similar high levels of conservation have also been reported between L. culinaris ssp. culinaris and M. truncatula  and other closely related legumes such as L. culinaris ssp. culinaris and P. sativum , M. sativa and P. sativum , M. truncatula and P. sativum , M. truncatula and M. sativa . This study also shows markers originally designed from genes on the same BAC clustered in corresponding syntenic areas in lentil and faba bean. The mapping populations were too small to resolve marker order in lentil and faba bean but extensive conservation of gene order,(and microsynteny) has been shown in previous studies between other legume species at similar or greater phylogenetic distances [12, 31–34], and to some extent between M. truncatula and Arabidopsis [33–35]. A higher level of homology between V. faba and L. culinaris ssp. culinaris compared to that between V. faba and M. truncatula could be inferred from this study based on the common markers mapped in the two genomes, common homology with M. truncatula and similar pattern of rearrangements (Figures 3, 4 and Phan et al., 2007 ). This finding agrees with phylogenetic studies that place the genera Vicia, Lens and Pisum within the tribe Viceae while Medicago and Melilotus form a parallel tribe Trifolieae within the Galegoid or cool season legumes , and is consistent with different levels of macrosynteny observed between M. truncatula, P. sativum, V. radiata, G. max, and Phaceolus vulgaris dependent on phylogenetic distance . However, chromosomal rearrangements were evident (Figures 2 and 3). Rearrangements involving Mt6 and Mt3 in particular may explain the differences in chromosome number between the two species (M. truncatula: n = 8; V. faba: n = 6). Mt6 might be considered unusual and is largely composed of heterochromatic DNA , contains few transcribed genes  and a large proportion of resistance gene analogues . In this study no corresponding linkage group was detected in faba bean, as found previously in pea  and lupin [13, 14], together with less than five percent estimated coverage by the L. japonicus genome . 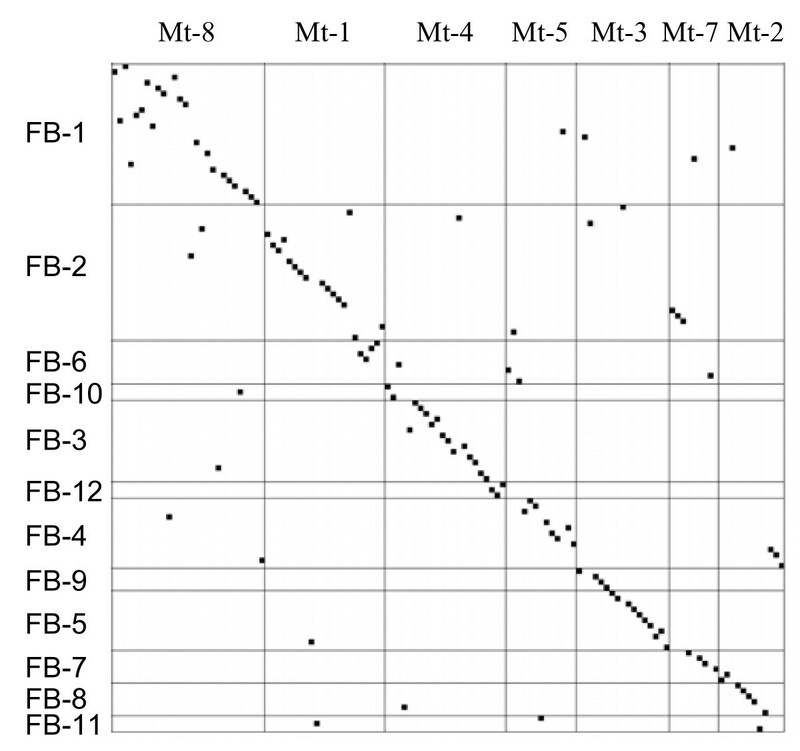 In faba bean FB5 and FB9 appear to correspond to Mt3. This configuration is supported by a similar pattern in lentil (Figure 4B and Phan et al., 2007 ), although a larger number of markers are needed to confirm this. The faba bean comparative map constructed here is consistent with the pattern of chromosome conservation previously observed, where different levels of conservation were found to be relatively consistent between M. truncatula and other legume species i.e. high conservation of M. truncatula chromosomes 1, 5 and 8; moderate conservation in the M. truncatula chromosomes 2, 3, 4 and 7 and lowest conservation in the M. truncatula chromosome 6 (Figures 3, 4 and ). As described above, no homology was identified with M. truncatula chromosome 6 in this study. The alignment of this faba bean map with lentil and the current M. truncatula genome based on M. truncatula genome assembly Mt2.0 is slightly different to that based on an earlier assembly . The changes can be observed in Figure 3B where orthologous markers which were syntenic to M. truncatula chromosome 6 in lentil are now co-linear with M. truncatula chromosome 1 in common with faba bean. Genome studies have demonstrated different factors are responsible for genome size variation and speciation. These include ancient polyploidisation events in the case of the Brassicas ; segmental or region-specific duplication ; and genetic rearrangements, transposable element amplification, or combination of different genome modifications . Large scale rearrangements, duplications, or polyploidisation were not apparent in this study, possibly as a result of the focus on single locus markers, however differences in non-coding repetitive DNA or transposable elements provide a possible explanation for the large differences in genome size. Retroelements are known to account for substantial proportions of these Viceae genomes as shown by extensive studies in pea, for example [43, 44], and more recently Vicia [45, 46]. Local genic rearrangements similar to that in found in the grasses (duplications, translocations, and insertions or deletions) may explain multiple PCR amplicons [19, 20]. The shared macrosynteny among the three species demonstrated here and even higher level of homology between L. culinaris and V. faba will undoubtedly facilitate the identification of markers closely linked to traits of interest in V. faba. Alignment of this map with existing faba bean maps containing important traits with polymorphic SSR markers and/or markers developed in this study, coupled with cross-reference to the abundant genetic information from the Medicago genome sequencing and extensive EST libraries available for the model legume species, will undoubtedly assist this process. As the parental line Vf6 has been used in a number of genetic and QTL mapping projects [6, 7, 9], this map can serve as a central reference map. This study has provided a number of significant outcomes for faba bean genomics and legume genomics in general. This research was supported by an ARC Linkage project LP0454871, the New South Wales Departments of Primary Industry and the GLIP project FP6-2002-FOOD-1-506223. SE and RPO designed the research. HTTP and SE wrote the manuscript. HTTP, SE and MG performed marker polymorphism discovery and population genotyping in Perth. JH assisted with informatics procedures. AMT, CMA and SC-I were involved in developing recombinant inbred lines and marker polymorphism discovery of GLIP markers in Córdoba. All authors read and approved the final manuscript.